If your passport was issued less than one year ago, use form DS-5504. 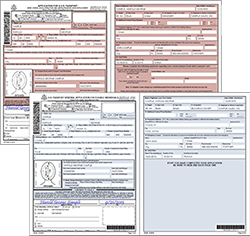 If your passport was issued more than one year ago, use form DS-82. Your current US passport book. Submit the original, not a copy. US Passport Form DS-5504 or US Passport Form DS-82. The application must be created online at http://pptform.state.gov then printed and signed with a pen-to-paper signature in black ink. The signature must match the signature in your current passport. When completing the About the Applicant section of your passport application form, list your current legal name as it should appear on your new passport. The photo must be on high-quality photo paper with a white background, taken within last six months. A business letter (on company letterhead) stating that a passport is required for travel. This letter must signed by a representative of the company other than the applicant with an original pen-to-paper signature and must specify the applicant’s departure date(s) and destination(s). The original document or a certified copy of your Marriage Certificate, Divorce Decree, or Court Order for Name Change. A photocopy of the front and back of your driver’s license showing your new name. $170.00 if your passport was issued more than one year ago. $60.00 if your passport was issued less than one year ago. Letter of Authorization, emailed separately to you after consulting a travel specialist. The Letter of Authorization (LOA) allows us to represent you to all agencies involved in issuing your passport. The signature on the LOA must be an original pen-to-paper signature in blue or black ink, and must match the signature on your current passport and your application form. No faxes, scans or copies will be accepted.